One of the more pleasing spin-offs of the Victorian sacramentalist revival in the Church of England was a renewal of interest in the spiritual welfare of the dead. From the 16th century Reformation until the middle of the 19th century, prayers for the dead were treated with grave suspicion, if you'll excuse the pun. However, their visibility in Catholic life and practice made them a priority for the 19th century reformers, and although it seems to have died away again, replaced by the mawkish modern practice of 'remembrance', it has left a fine legacy in English parish churches. Few places more so than here, in the gentle hills to the south of Blakeney. In 1899, Sir Alfred Jodrell, of nearby Bayfield Hall, was distraught at the death of his mother, Adele Monckton. The previous year he had paid for the restoration of Saxlingham, and now he set about rebuilding the ruin of St Martin, Glandford, in her memory - no, not just in her memory, for Sir Alfred was a convinced Anglo-catholic, and he wanted this church to be a focus of prayer, and a setting for Masses for her soul. He left a bequest so that such Masses should happen annually in perpetuity. Using a cocktail of the local Decorated and Perpendicular styles, and retaining the layout (the arcade inside is the 15th century original) he created a tiny jewel of a church on this velvet hilltop. His other great passion, his shell museum, is in the field below. 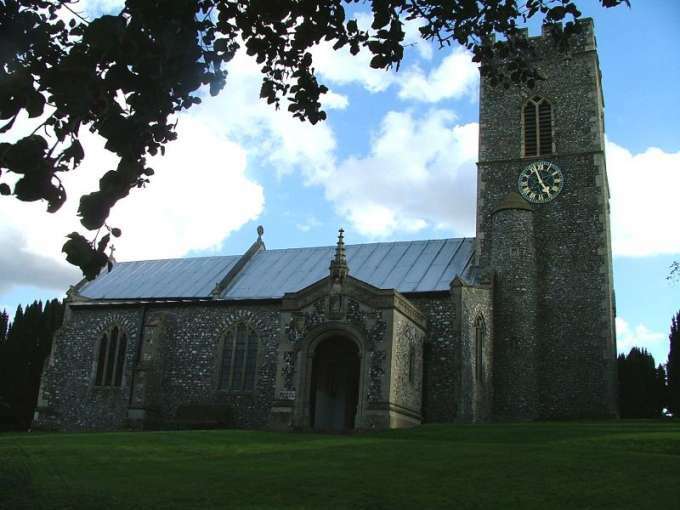 St Martin has echoes of the great London Anglo-catholic shrines, and also of Booton a few miles off; but here, everything is tiny, all on an intimate scale. As you open the door, the lights come on automatically (a surprise in the fading light of a late autumn afternoon, I can tell you) and the first sight to make your breath catch is the opulence of the woodwork: extraordinary carved benches, the screen, the hammerbeam roof with its angels. 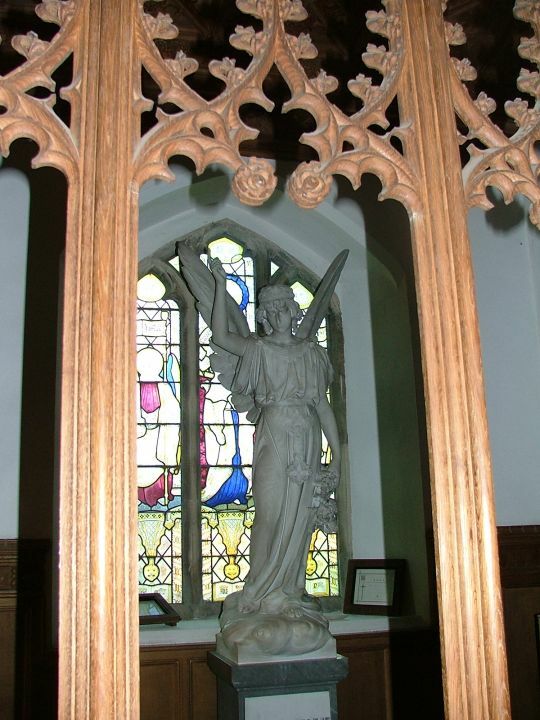 Also striking is one of only two modern seven sacrament fonts in East Anglia (the other is at Sheringham St Joseph), carved in the manly style of the early 20th century - those muscular Priests mean business. There is a good window of the Three Marys, but generally, the light is filtered through some fairly grim glass. It reminded me of the north transept at Salle, and I wasn't surprised to read later that Sir Alfred oversaw the restoration there. In the north aisle chapel is a fine sculpture calling us to pray for the soul of Adele Monckton. It is rather moving, and yet not a place of the dead at all; it has the feel of the heart of a faith community. Above the smell of furniture polish I could detect something else which ached to be incense, but was probably just the lilies in the flower display. For now, the Anglo-catholic flood has receded. Coincidentally, Adele Monckton died 105 years to the week before my visit, and looking at the church noticeboard I was pleased to see that Sir Alfred's bequest is still honoured; but it appears to be as little more than a memorial service for parishioners who have died, rather than an intercessionary Mass for Adele Monckton's eternal soul. Ah well, the world moves on.